6 months of personalized herbal care for menstrual health, hormonal balance, womb trauma, infertility, and emotional balance. 6 months of personalized herbal remedies and rituals for menstrual heath, fertility, connecting to your intuition, and power of manifestation. The Moonrise Menstrual Reset begins around the new moon in cancer and ends 6 months later on the full moon in cancer. Both the moon and the sign of cancer are associated with feminine health. For 6 months you will receive personalized herbal support to help regulate your cycle and connect you to your womb as a center of creation and manifestation. We'll open with a one-on-one herbal consultation where I'll asses the right herbal remedies, nutrition, self-care, and rituals for your healing. 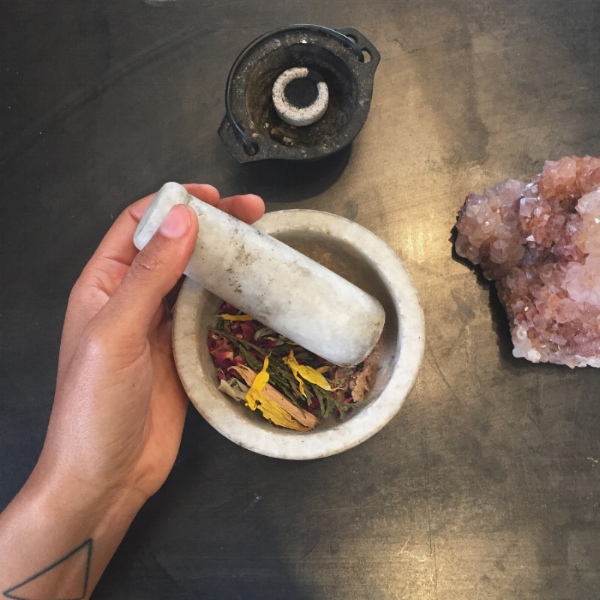 Each month you'll receive your handmade custom herbal remedies delivered to your door. We'll also have a 30 minute check-in each month to asses any changes that need to be made and determine your monthly ritual. Rituals will be based around your intentions and healing goals and are done to focus on the spiritual aspect of the healing process. There are a limited number of spaces for this offering email me at raven@moonmedicine.co letting me know why you are a good fit. Healing is not linear. For that reason, I will help you create rituals that you can perform to address the spiritual contributors to imbalance. The herbs for your rituals will also be a part of your monthly delivery. Rituals will also be tailored to your astrological chart. Keeping a journal throughout the process will help you see the long lasting effects of your work. After our initial consultation, I'll create a protocol of herbs, nutrition, self-care, and rituals. This will be a set of guidelines that fit within your lifestyle to ensure you see the best results. You'll also receive downloadable guides and charts to help you keep track of your progress. Each follow-up session gives us an opportunity to further refine your healing process. The Moonrise Menstrual Reset is a 6 month auto-renewing subscription for $160 a month. Or $800 when paid in full. That's the same as 1 month free. Email me at raven@moonmedicine.co and tell me why you are a good fit for the Moonrise Menstrual Reset. Due to the personalized care participants will receive I’m offering a limited number of spaces. Sign up for the reset by sending me an email about why you think you're a good fit. This program is available to those in the US and Canada (with additional shipping costs for Canadian residents).